The Texas Environmental Trade Fair and Conference is May 5 – 6, 2015 at the Austin Convention Center. The Texas Environmental Trade Fair is always a great time to meet friends and conduct business. Stop by and see us at BOOTH 1025. 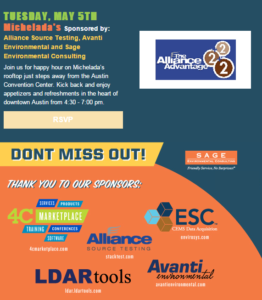 On Tuesday, join us for happy hour on Michelada’s rooftop just steps away from the Austin Convention Center and kick back and enjoy appetizers and refreshments in the heat of downtown Austin from 4:30 until 7:00PM. Click Here to register. Want more information about the 2017 conference? The Environmental Trade Fair and Conference (ETFC) is Texas’ premier environmental educational forum. The Texas Commission on Environmental Quality strives to protect public health and natural resources consistent with sustainable economic development. Our goal is clean air, clean water, and the safe management of waste. hire, develop, and retain a high-quality, diverse workforce.